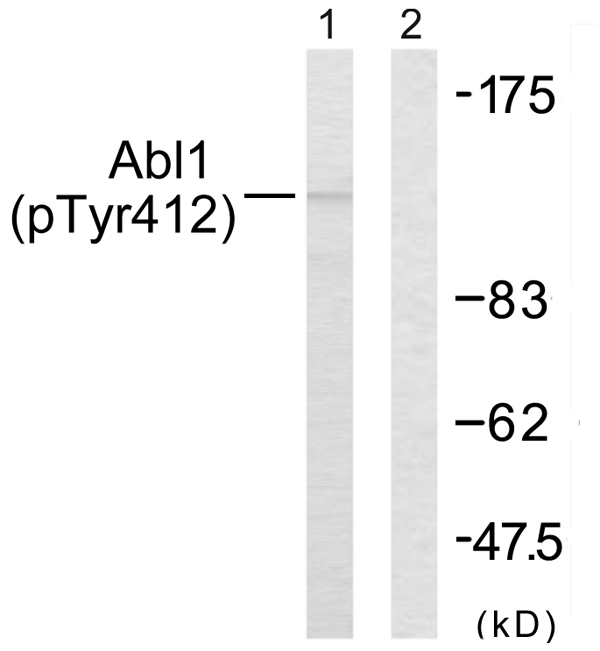 Abl (Phospho-Tyr412) Antibody detects endogenous levels of Abl1 only when phosphorylated at tyrosine 412. 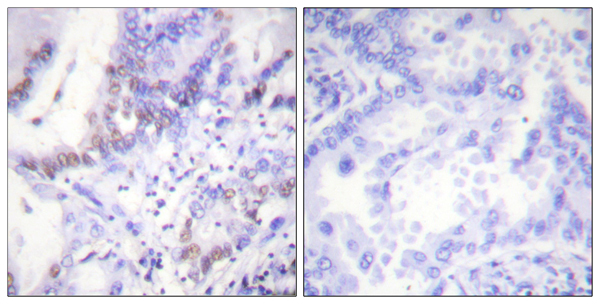 P-peptide-+ Immunohistochemical analysis of paraffin-embedded human lung carcinoma tissue using Abl (Phospho-Tyr412) Antibody (#A0403). Western blot analysis of extracts from COS7 cells, treated with Adriamycin (0.5ug/ml, 24 hours), using Abl (Phospho-Tyr412) Antibody (#A0403). Fotis A. Asimakopoulos, Blood, Oct 1999; 94: 2452-2460. Thomas Burmeister, Blood, Nov 2006; 108: 3556-3559. Kim De Keersmaecker, Blood, Jun 2005; 105: 4849-4852. Florian Klein, J. Exp. Med., Mar 2004; 199: 673.